ANNE Black from Killough thought she was going shopping to Forestside the other day but was in for a great surprise with a family and former get-together of her work colleagues. She had just retired from working as a home help after 31 years and her family organised a little treat to mark the occasion. 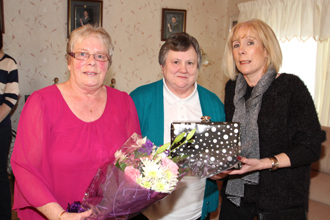 Former work colleague Anne Higgins with Geraldine Branniff, Home Care Agency Service Manager, make a presentation to Anne Black on her retirement as home help. Anne had first started working with the then Down Lisburn Trust on 1 Febraury 1981 after her mother had died in January that year. ”It was a real pleasure seeing my family and work colleagues all turn up last Sunday. My 31 years as a home help were very enjoyable,” said Anne. “The people I worked with were a great team and we all became close friends. Delores and Anne would have worked a 30 hour shift each week and and I did 24 hours. It was quite hard work back then in te early days. I could have covered perhaps 14 homes in a day and in each was expected to clean out and set the fire. That’s why my knees are in poor shape today and I’m using crutches. But the methods of home care have changed now and Anne said: “Back in the old days, we were more involved in looking after people’s homes, but now the carers are more involved in Personal Care. They make sure that the elderly clients are washed, and dressed properly, and that their food is prepared for them. “I enjoyed every minute of it,” added Anne, “and I miss it terribly. I had to have my own car back in the early days as my mother could not get around. I would have been off to work in the morning at 9am and be finished my shift after lunchtime. But now they work in shifts from 8-2pm and 2-10pm ensuring that the elderly clients are cared for. 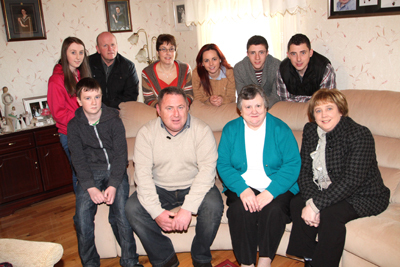 Anne Black, second front right, with her son Paul, daughter Roisin and family members. “Many lived in rural areas and didn’t see one person from one day to the next. We were often their only contacts with the outside world. Over the years we came across many characters and they shared a lot with me in their later years. “The changes in the system are definitely for the better. The new Home Care Agency is focused on providing proper Personal Care for them and we have moved well away from the old idea of a home help being someone who scrubs and Spring Cleans every day. Anne reflected on growing old just as her own clients had done and she said: “There are things we have to consider when the time comes. I used to live in an upstairs house near Duffy’s shop in Killough, but my mother could not get up and down the stars. So we moved eventually. 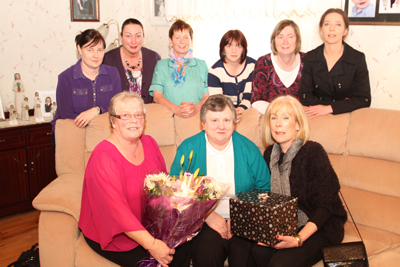 Anne Black, front centre, pictured with her former work colleagues at the Home Care Agency after her retirement as a home help fro 31 years. On reflecting on her early days, Anne said: “I can remember wearing wellie boots to go to schools as there were so many pot hole son the road and I’d change into my shoes at the bottom of the lane. I was one on the first pupils at St Mary’s High School in Downpatrick when it opened up and fifty years on my grand-daughter Karen is now at the school. I have a son, Paul, and a daughter, Roisin, and five grand-children. Anne Black’s contribution to the quality of life for many elderly people across the district has been a tale of personal dedication and courage and all her work colleagues wished her all the best in her well-earned retirement.